Attention Arawasi International Subscribers and Website Visitors! Firstly, thank you so much for taking the time to visit our site. Around four and a half years have passed since the first homemade issue of what was then simply Arawasi made its debut. Issue 6, the first to be professionally printed and bound, marked the change of title to Arawasi International and heralded the start of a new era in the summer of 2007. As we move towards 2010, production time constraints and simple economics now dictate that all of the original homemade issues (Issues 1- 5) be declared out of print, with immediate effect. The good news, not only for those of you who missed out first time round, is that the first of two 50-page compilation magazines is now available. 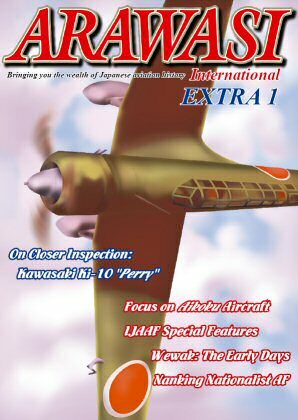 Featuring selected articles from these back numbers with more photos, enhanced, updated and, where necessary, corrected material, Arawasi International Extra 1 concentrates primarily on Imperial Japanese Army Air Force (IJAAF) subjects. As you've come to expect, we'll be adding a few typical Arawasi surprises to the mix. Offering heartfelt thanks and best wishes for the New Year to all our readers around the world, we look forward to your continued support in our endeavours to bring you the wealth of Japanese aviation history.